The Dnister Hotel is situated in historical centre of Lviv next to an old park and the architectural monument of the 18th century - St.George's Cathedral. The hotel offers accommodation in 150 comfortable rooms of different categories ranging from Standard to Suite. In-room amenities include: modern furniture, cable TV, direct interurban and international telecommunication, Internet access. Breakfast is served for guests of the hotel every morning. The Dnister restaurant, situated on the second floor of the hotel, offers various dishes of Ukrainian and European cuisines. 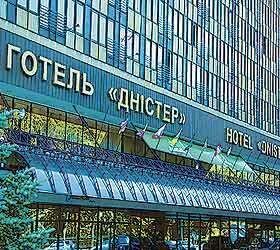 The restaurant is able to receive up to 230 guests and consists of two halls: the Central Hall and the Lvivsky Hall, where banquets, seminars and conferences may be arranged. The Panorama bar, situated on the ninth floor, invites guests to enjoy coffee and homemade cakes. The cafe on the second floor is open round-the-clock. It offers two billiards tables, a diverse wine list and light snacks. The Dnister Hotel is well-equipped for hosting conferences, seminars, business meetings, and other events. Conference facilities include: three conference halls with necessary equipment for 30 - 180 pax, two meeting rooms, a business centre with up-to-date facilities. The Dnister Hotel also offers the following facilities and services: 24-hour room-service, a beauty parlour, a solarium, a sauna, laundry and dry-cleaning services, a guarded parking lot, concierge service, car rent, a bank office, a luggage room, safe deposit boxes, currency exchange, ATM, Wi-Fi Internet access, air and railway tickets booking.